Attach the engine support bar. Remove the front engine mounting auxiliary bracket. Remove the front engine mounting bracket. Raise the engine with the engine support bar. 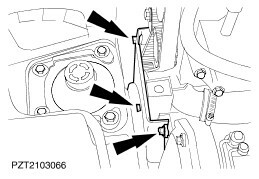 Unscrew the top bolts of the lower timing belt cover. Lower the engine with the engine support bar. NOTICE: To slacken, turn the bolt clockwise. Slacken and remove the drive belt. 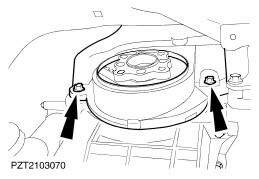 Remove the crankshaft pulley/vibration damper. Disconnect the alternator and remove it. NOTE: Turn the engine in the direction of engine rotation. Turn the crankshaft approximately to TDC. 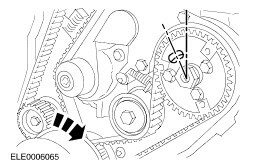 Turn the crankshaft in the direction of engine rotation until the slot in the injection pump timing belt pulley is at the 11 o'clock position. Turn the crankshaft to the TDC position. Remove the blanking plug from the cylinder block. NOTE: The alignment pin must be screwed in as far as it will go. Screw in the timing pin. 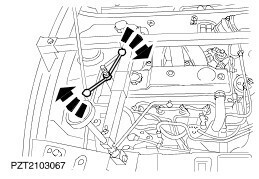 Carefully turn the crankshaft in the normal direction of rotation of the engine until it comes up against the timing pin. 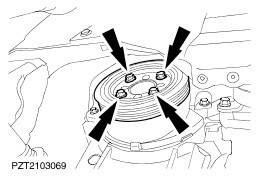 Insert the alignment pin into the camshaft timing belt pulley. 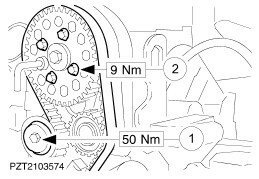 Slacken the bolts of the camshaft timing belt pulley. Remove the camshaft timing belt. 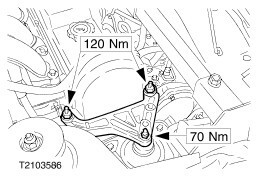 Slacken the clamp bolt of the timing belt tensioner. 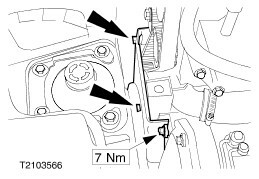 Slacken the timing belt by compressing the spring using water pump pliers. 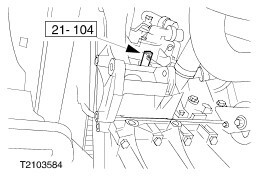 Tighten the clamp bolt of the timing belt tensioner. Always renew the camshaft timing belt and the injection pump timing belt. 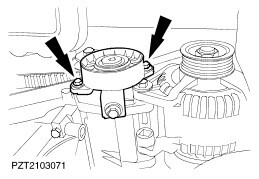 The crankshaft must touch the alignment pin and the alignment tool must be fitted into the camshaft timing belt pulley. NOTE: Slots. 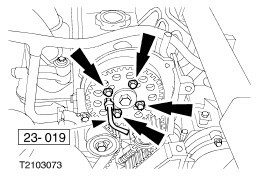 The camshaft timing belt bolts must be centred. 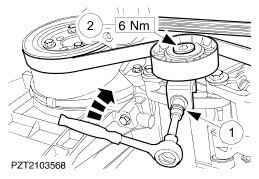 NOTE: Fit the timing belt with the slack side nearest the timing belt tensioner. 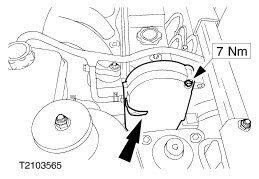 NOTE: Slacken the clamp bolt of the timing belt tensioner and let the timing belt tensioner snap against the belt. Fit the new camshaft timing belt. 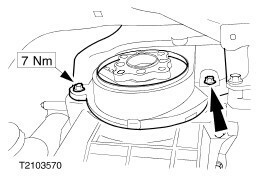 Tighten the bolts of the camshaft timing belt pulley. 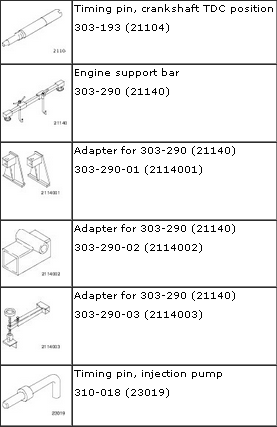 NOTICE: Remove Special Tools 303-193 (21-104) and 310-018 (23-019). Preparations for tensioning the timing belt. 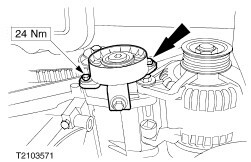 Turn the crankshaft six turns in the normal direction of rotation of the engine. Screw in the timing pin. 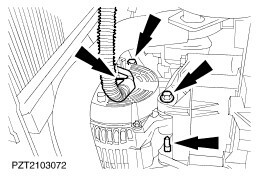 Carefully turn the crankshaft in the normal direction of rotation of the engine until it comes up against the timing pin. 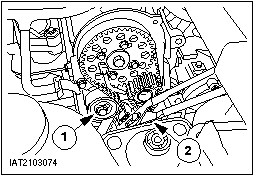 The timing pin must be able to be inserted in the camshaft timing belt pulley. 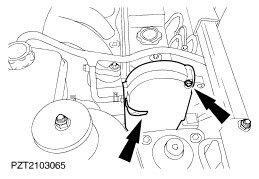 NOTICE: Used timing belts must not be retensioned. NOTE: All timing pins must be inserted correctly. 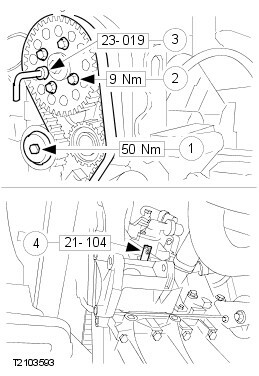 The crankshaft must touch the timing pin. 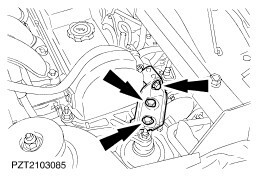 NOTE: Slacken the camshaft timing belt tensioner bolt by one quarter turn, so that the timing belt tensioner presses against the timing belt. 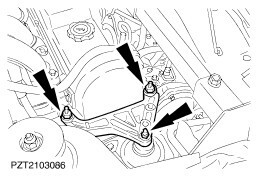 Tighten the camshaft timing belt tensioner bolt. 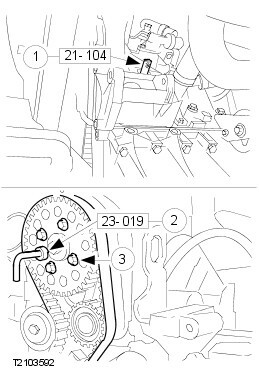 Tighten the camshaft timing belt pulley bolts. 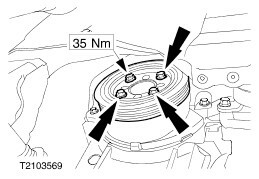 Remove the alignment pin and tighten the blanking bolt to 24 Nm. 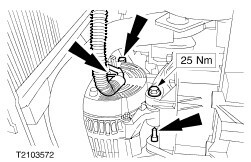 NOTICE: Position the alternator and screw in the bolts finger tight. 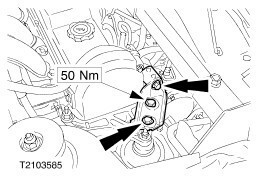 First tighten the bolt on the pulley side, then the rear upper long bolt and finally the rear lower short bolt. Install the alternator and connect it. Fit the lower timing belt cover (two bolts at the bottom). Fit the crankshaft pulley/vibration damper. 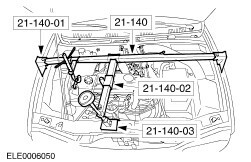 Fit the drive belt and tension as described in Operation No. 31 413 0. 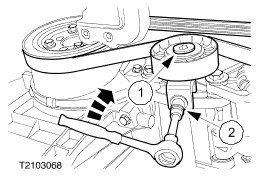 Attach the lower timing belt cover. Fit the upper timing belt cover. Fit the front engine mounting bracket. Install the front engine mounting auxiliary bracket. Detach the engine support bar. Carry out a road test to enable the PCM (EEC V) to collect data.